Faster than a speeding roadrunner, able to leap tall bookshelves in a single bound, these mild-mannered creatures possess extraordinary superpowers—which perhaps explains why they would feel right at home in a comic book store. The Dodo animal blog profiles several of these heroic felines—many of whom were strays—by telling us their origin stories, special superpowers and, of course, recommending cat-themed reading material. Tawna Lewis, whose comic book store is home for Dizzy (top), recommends Tales of Honor, a comic series set in a future world where super-intelligent six-legged cats hang out in trees. Like the Blob, the mighty Levi is immovable, and often chooses to demonstrate this power by napping in the middle of the store's busiest aisles. Claire's fine-tuned sense for danger lets her make herself invisible in a moment's notice. And Shoene's powerful premonitions allow her to just happen to be sleeping in the exact box where a customer was hoping to shop. 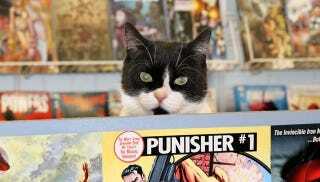 Meet more comic book cats at The Dodo.